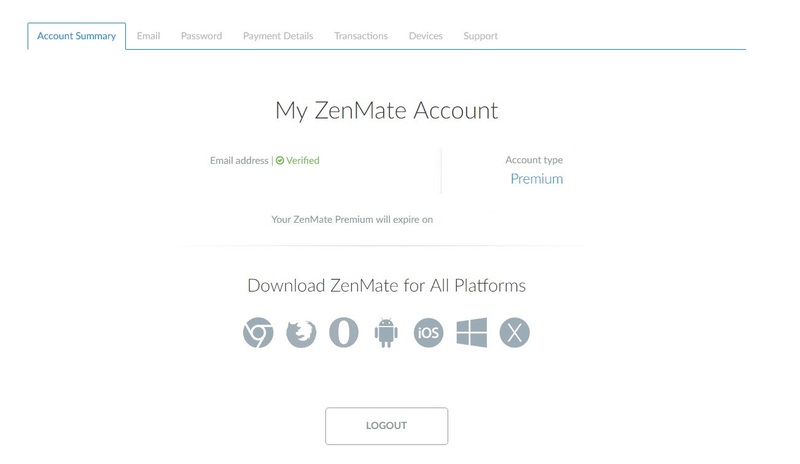 ZenMate VPN is a Germany (Berlin to be more precise) based VPN service that offers a fully featured package which can accommodate a wide variety of users. They offer servers in over 27 countries and support virtually all the major platforms available. We mentioned this aspect because in 2015 when we last reviewed the service, they were only offering a proxy add-on and a classic IPSec solution via the Android and iOS VPN apps. 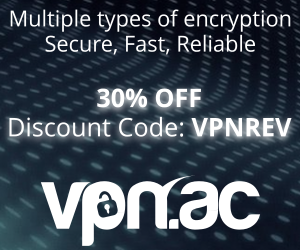 Since then, they have grown into a fully-featured VPN service that offers of multitude of features and possibilities that we will discuss in today’s review. They offer a 7 day free trial of the full product, which is great, because it’s more than enough time to test out the features and with no restrictions, there won’t be any surprises from this point of view if you decide to purchase the service. Once logged into the website, your dashboard allows you to quickly access all the information needed on a daily basis such as support, password change and more. Please keep in mind that e-mail verification is needed in order to sign up for both the free trial and the premium account. 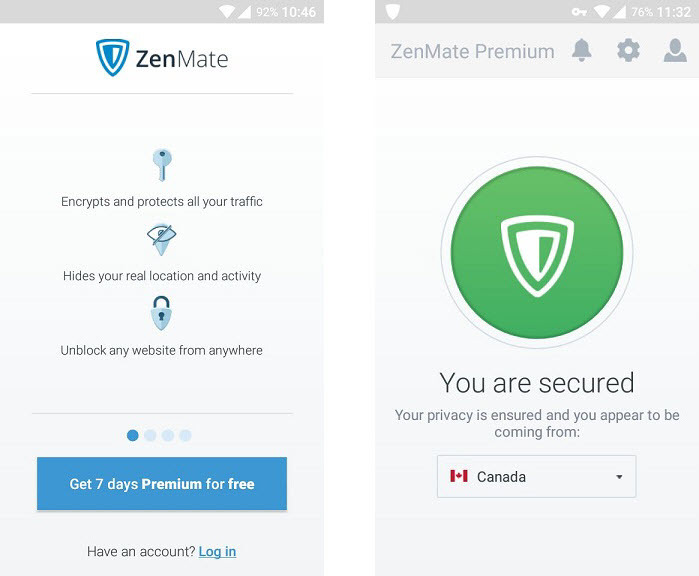 We tested out different aspects of the service, so let’s find out how well ZenMate VPN raises up to the VPN market standards. Depending on your needs and reasons for using a VPN service, it might be important that the service protects their customer’s identity. We weren’t able to find a warrant canary on their website and when asked, the customer support team did not reply, so keep that in mind in case it’s relevant to your particular situation. The Windows software was very intuitive and a real pleasure to use. There were no issues, interrupts or problems whatsoever and the design of the app is also very pleasant. The settings are available right from the main screen, allowing you to customize your experience very easily. However, there aren’t really enough settings available in our opinion. You cannot change encryption method, protocol or anything really besides the location and the kill-switch feature. 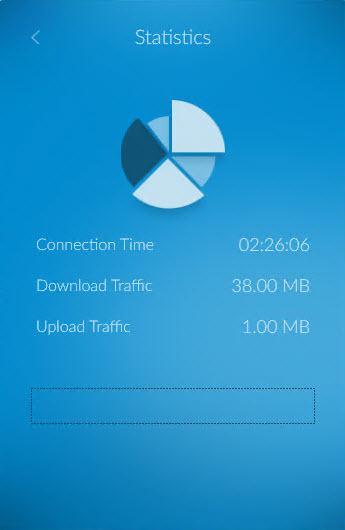 There is also a feature that allows you to see the traffic usage and connection times. It’s not necessarily a very useful information for everyone, it’s just useful if you have to monitor your traffic for whatever reason. We were very happy with the overall experience and we enjoy the evolution from browser extensions to such a well-designed application. There are minor details that could be polished (such as tool-tips when you hover over click-able content) but as with any service, we assume it’s a matter of time. The only available app feature we would like to discuss is the EverSecure feature (which in layman’s terms is the kill-switch with a fancier name). Not having that tool-tip we mentioned before can make it difficult at times to figure out what each feature or setting does. There is an additional function that lets the app run in the background, but that’s pretty much it. The encryption used for OpenVPN is AES 256 CBC with 2048 RSA for key exchange. 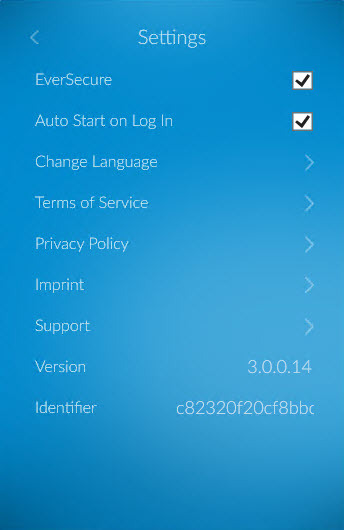 The configuration files may have to be downloaded for some of the operating systems not supported via an app, so make sure you check out their website for an up to date list. There is no field or place that allows you to change encryption method, protocol or anything really, which we feel is a negative aspect. The web browser extensions are still available for Chrome, FireFox and Opera and they have features available such as tracking protection, malware blocking and smart locations. It really depends on whether you need the VPN connection from browsing or torrenting, but it’s nice to know that all these features are available under one single account and subscription. The speed test results were great, well above average and they were reflected in the functionality as well. The browsing was fluid, there were no interruptions and we were able to stream media content without any issues. 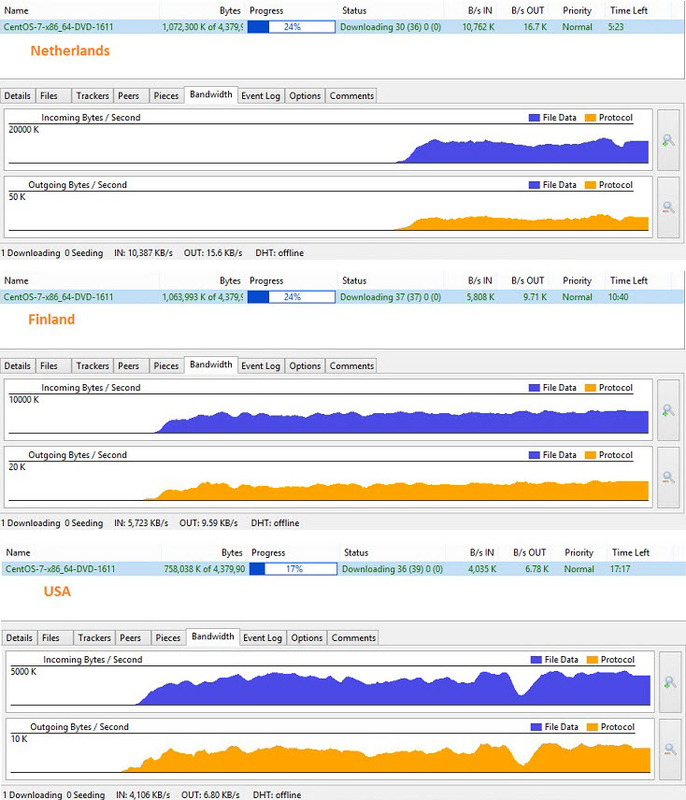 The torrent browsing speed was also pleasantly good, even in locations that normally score a bit lower such as the US. These are not the best torrent speed test results we’ve seen, but they are good and with some work in the infrastructure department it could become one of the top players in this department. It’s hard to estimate the long-run but so far it seems promising. We tested out the Android application for this segment and it left us a very good impression. 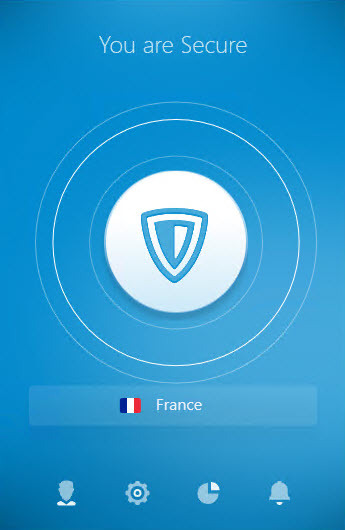 The mobile application is great, and we feel that the mobile VPN service overall is on of the strong points of ZenMate. There is a full review available for the mobile service, if you are interested in a more in-depth analysis. It will also allow you to compare the results to those of other similar services available on the market. To summarize however, we found the mobile application to be great, intuitive and fully functional. We would even go as far as saying that it left a better impression than the windows application did. We liked the fact that they allow easy customization in the mobile app as well, staying in sync with the Windows app theme. The Android application needs very little improvement, and it’s mostly personal preferences such as tool-tip display when hovering menus or features. As a whole, the app left us a very good impression not only design-wise but functionality-wise as well. 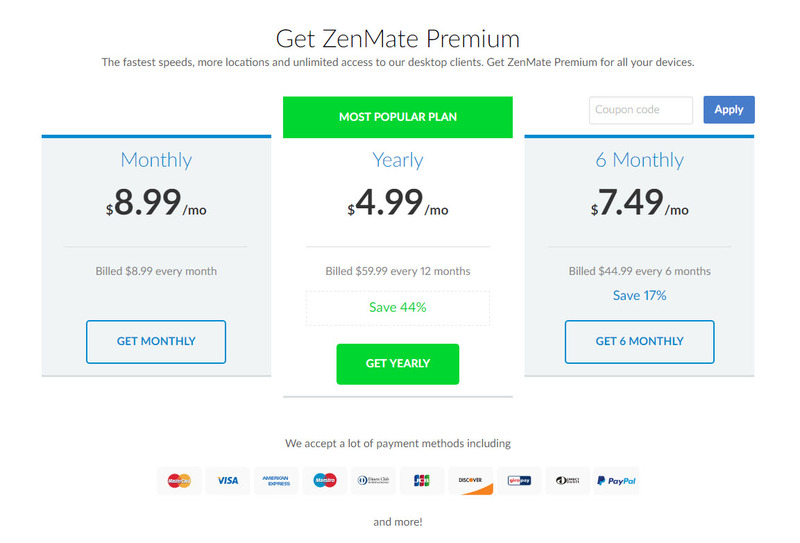 ZenMate VPN has a fair pricing plan, and it is as follows. They are not necessarily the cheapest out there, but taking all the features into consideration, the year-long subscription discount and the quality of the product, we feel it’s a fair price. 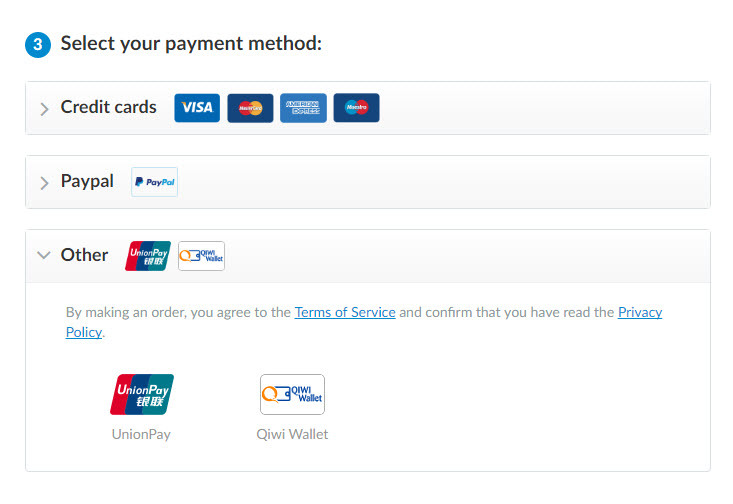 They accept most of the major payment methods, however, we weren’t able to find a way bitcoin as an accepted method. We contacted the customer support team, but there was no response regarding this issue either. As you may have already realized, ZenMate VPN’s customer support team is not the fastest when it comes to response times. We sent them two support requests regarding different issues and a day later there was no response, even though our questions were general, nothing technical or that required troubleshooting. We would normally not be discouraged by the response time, but they do emphasize the fact that they offer 24/7 support for their premium accounts, which would normally mean we would get a response. We will keep you posted if there is any change as far as the responses from the support team goes, but for the time being we are very disappointed with this aspect of the service. 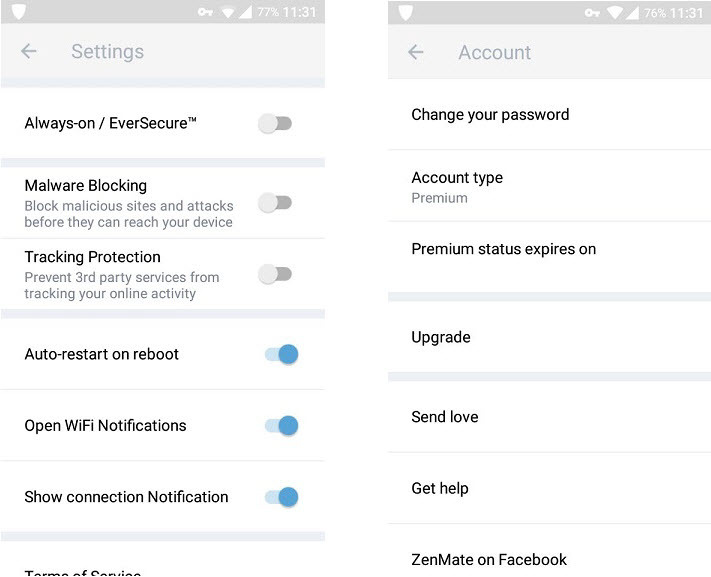 In conclusion, we feel that ZenMate VPN is a complete VPN service with some useful features, but they still require improvement in some departments. Here is a quick breakdown of what we liked and what we didn’t. Very easy to use service and applications. Support for all major operating systems and platforms. 7 day free trial for the premium service (no restrictions). Great FAQ page and installation guides. Great browsing and torrent download speeds. Payment method issue not resolved, unsure of whether they accept Bitcoin or not, although all evidence points to no. Could use more server locations. Application is a bit too simple lacking the possibility to customize. Poor (non-existent) technical support experience.